This charming country home offers much more than just great style. It also features a floorplan designed for the busy lifestyles of families today. The large great room features a gas log fireplace, coffered ceiling, and provides a perfect place to entertain guests. The well-equipped kitchen features two raised bars, a walk-in pantry, and beautiful views through large windows in the breakfast area. The master suite features a trayed ceiling, large walk-in closet, dual lavatories, jet tub, separate shower, and enclosed toilet. The other three bedrooms all include walk-in closets and share access to the second bathroom equipped with dual lavatories and separate toilet / tub room. 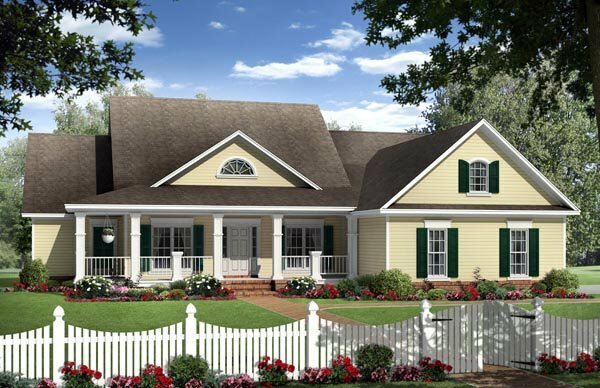 This home also features great porch areas for outdoor entertaining and a large two car garage complete with separate storage space. Make this your family's next home! Question: Can this plan be done with a crawl space?